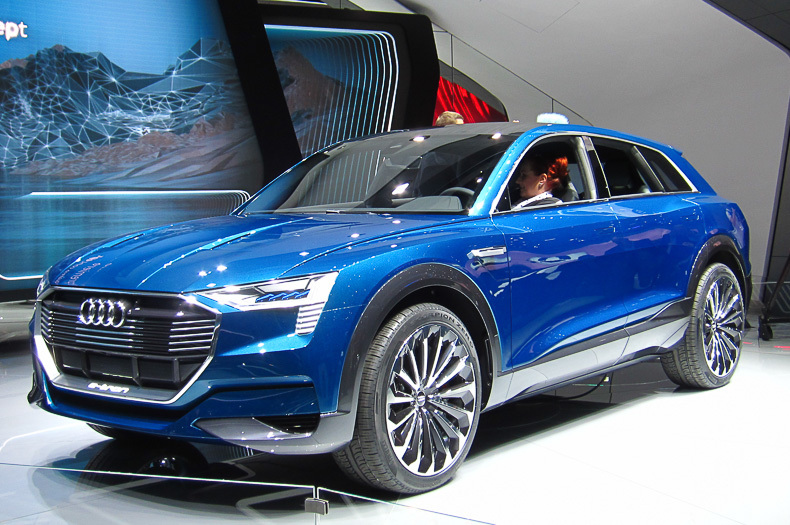 The Audi e-tron quattro Concept previews the Tesla Model X-rivalling Audi Q6, which will be presented in early 2018. It uses the power of three electric motors; one drives the front axle, the other acts on the rear axle. Total output is 435 hp and in boost mode it can mobilize up to 500 hp and 800 Nm torque. It accelerates from standstill to 100 km/h in 4.6 seconds, while its electronically governed top speed is 210 km/h. The battery’s capacity of 95 kWh should enable a range of more than 500 kilometers. With its length of 4.88 metres, width of 1.93 metres and height of 1.54 metres, it fits between the Audi Q5 and Audi Q7, and its luggage capacity is 615 litres. 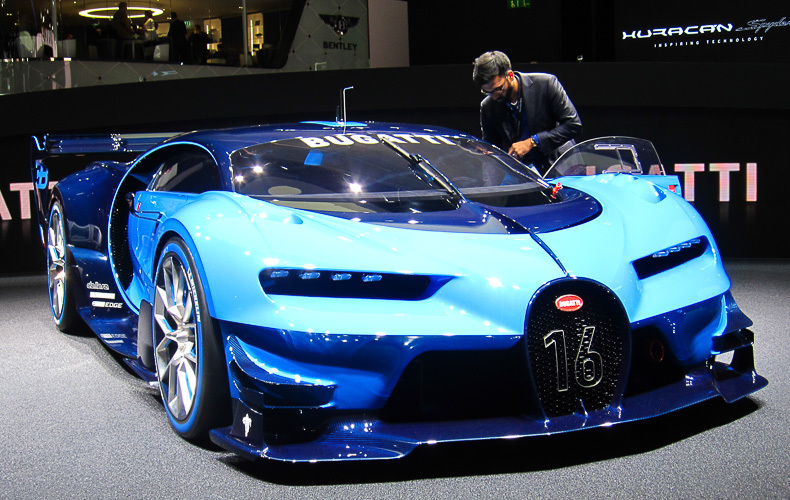 The Vision GranTurismo showcases Bugatti’s new design language and previews the Chiron, which should debut at the Geneva Motor Show next spring, although the Volkswagen emissions scandal could delay the new ‘Chiron’ hypercar. Sales of large MPVs in Europe are up a modest 6% after the first 9 months of the year, which could make 2014 the first year since 2007 that the segment has grown year-on-year. After contracting 17% last year, with only 2 out of the 9 models in the segment increasing their sales, the trend seems to have reversed, with 6 out of 9 models gaining ground. This means the growth of the segment isn’t due exclusively to the sell-out pricing of the Ford S-Max and Galaxy, which are to be replaced next year. The VW-group twins Volkswagen Sharan and Seat Alhambra are the two models that add the most sales, maybe a bit less surprising if you consider they are still the freshest models of the major players in the segment, at four years old. The midsized segment has been in crisis for a decade now, but the sales decline seems to bottom out, with sales down “only” 5% after the first three quarters of 2014, to just over 400.000 units. With the new generations VW Passat and Ford Mondeo ready to start their customer deliveries, and the Peugeot 508 recently facelifted, the segment should be able to return to positive territory for only the second time since 2001. The VW Passat remains stable and increases its share of the segment to 28,8%, and that’s even without the new generation, which has only just entered European showrooms and should start customer deliveries anytime now. After the first nine months of 2014, the minicar segment is still in negative territory, although just. Sales are down 1% or less than 5.000 units on last year, which means sales have improved in the third quarter, thanks to a strong performance for the segment leader Fiat 500 and the new generation Kolin triplets. The Fiat 500 goes from strength to strength and seems to be unstoppable. In September, European sales of the already six-year-old model were above the 20.000 cars per month mark for only the second time ever, after last March. The 500 hasn’t just confirmed its leadership of the segment, which it took from the Panda exactly one year ago, it even added more sales than any other model in the segment, increasing its share of the segment to 15%. By itself, the 500 sold almost as many cars as the Volkswagen Up!, Skoda Citigo and Seat Mii combined. Honda has confirmed rumors that the brand has no plans to develop a replacement to the European version of its Accord midsized sedan and station when the current eighth generation reaches the end of its life cycle. This shouldn’t come as a surprise considering the model’s sales have been decimated in the last decade. In 2004, Honda sold a record of 48.346 Accords in Europe, but that figure has dwindled more than 90% to a mere 4.467 units last year, while 2014 sales are off another 35% year to date.